Hull is another of those underrated away days which I always look forward to. It’s one of a few places that I can say we don’t have a dreadful record at too although last season’s FA Cup game was one of of numerous low points in 2017/18. The victory in the league there in October ’17 was one of only a handful of away wins but did get us lost in another of those false dawns as Warburton’s team swaggered their way to an impressive 3-2 win. 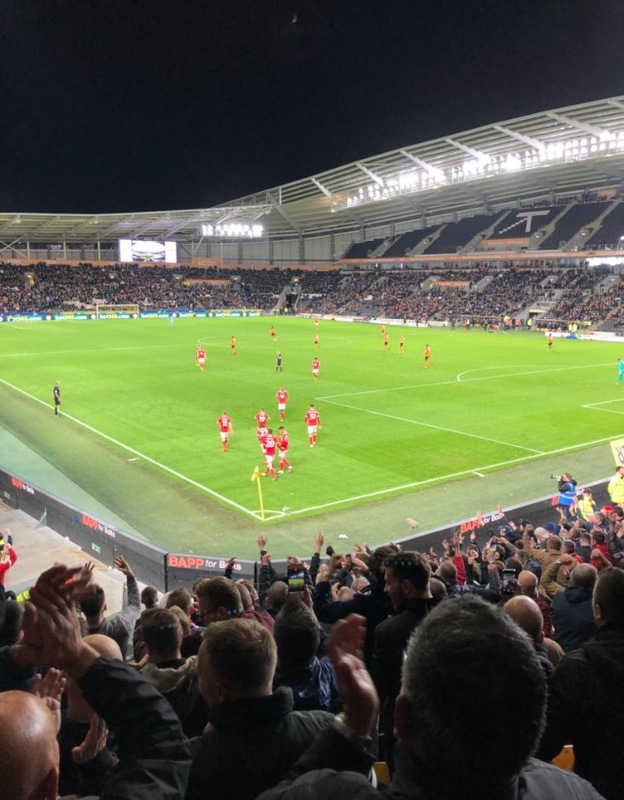 That game is also memorable for the protests from the home fans – something I ask our Hull fan about below – as frustration with the owner reached boiling point. Hundreds of yellow sponge balls were thrown onto the pitch in the first half from the home end with a few bonus ones from the away end too. This followed a protest march from a local pub to the stadium. Sadly Hull have yet to find their knight in shining armour although a takeover has seemingly progressed in recent weeks. TRAINS: Once again trains appear to be affected with a bus service operating for the final leg of the journey due to strike action by Northern Rail staff. I’ve not explored it fully but it seems that all services require a change in either Goole or Selby with a bus transfer in operation onto Hull. This also applies on the way back with most / all services wanting to direct you via Leeds. The cost of a standard return is £50.40 although this can be reduced to £38.30 if purchasing a return from Nottingham to Sheffield and then a separate return from Sheffield to Hull. Hull station is a fair trek from the stadium; probably around a 25 minute walk at least. Certainly do-able but keep this in mind when staggering out of pubs in the town centre and making specific trains back after the match. Of course there is always the option of a taxi which will reduce journey times. ROAD: Not a bad journey from Nottingham – M1 or Al (depending where you are setting off from) then M18 and M62 which will take you almost into Hull. The A63 will complete the route; a raised highway with the River Humber to your right. When you pass the Humber bridge you won’t be too far off. There is a sizeable area of housing just off the A63 which has plenty of street parking. It also offers a pretty quick exit out of Hull rather than the queues that build up closer to the ground. Last season for the league game we were invited to join some Hull fans at the William Gemmell social club, a 5 minute walk from the ground. A few doors down is the Griffin which seemed to be full of Forest fans judging by the noise. 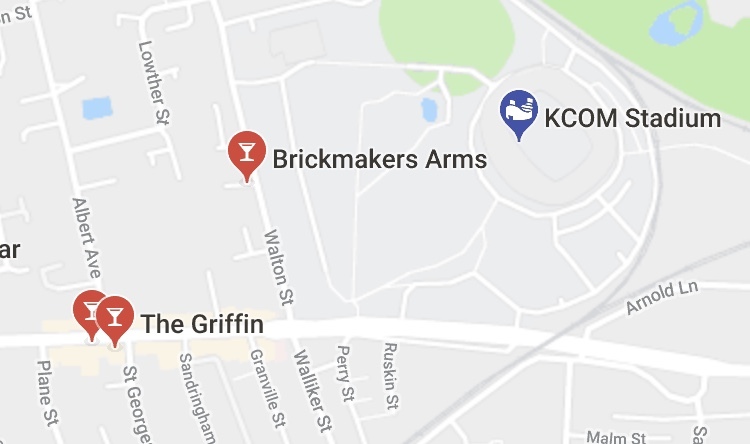 Around the corner from there is also the Brickmaker Arms where we started. The latter two are probably worth a shot if you are looking for somewhere closer to the ground. A little bit further away on a stretch of road called Princess Avenue is a decent area of bars and restaurants – sort of like the Hull version of Central Avenue in West Bridgford. We spent a few hours there before the cup game in Pave which was a mix of home and away fans and was a cracking place. It’s probably a 15 minute walk from there. The town centre is also full of decent pubs. The Mission is a usual stop for us just across from The Deep. A few seasons ago for a midweek game two of us also trawled around the old town which is definitely worth doing if time allows. Again, just be mindful that you are a fair way away from the KCOM from here. 1. We had two visits to Hull last season – one rather more memorable than the other for us. The league game was played out amongst a backdrop of protest marches and yellow foam balls that were launched onto the pitch. What’s the latest with the ownership saga? Despite talks taking place with a couple of interested parties and even some due diligence with one – it’s not moving. The general belief is that the hideous Allams will wait to cash in the last parachute payment in January before cutting their losses. That’s a figure of speech, they won’t lose anything – they’ve trousered plenty. 2. What’s your opinion on the protests that have occurred against Allam? Have they worked? After the aforementioned game last season I remember some Hull fans being critical of that approach. Our fans have been split on the Allams since the name change was first broached. I’m embarrassed to say that we have a section who are easily bought and would have accepted the club being a laughing stock for Premier League football. Everything has been divisive since although the dwindling of the fanbase and the loss of the fans who jumped on board once we were successful (as happens at most clubs) has united things somewhat. Those protests did create a bit of dialogue from the owners initially but that went nowhere. Sadly, most are now just resigned to waiting them out which will hopefully happen soon. 3. It’s been a difficult start to the season – can the reason for that be pinpointed or is it a host of contributing factors? It’s been coming for years now. 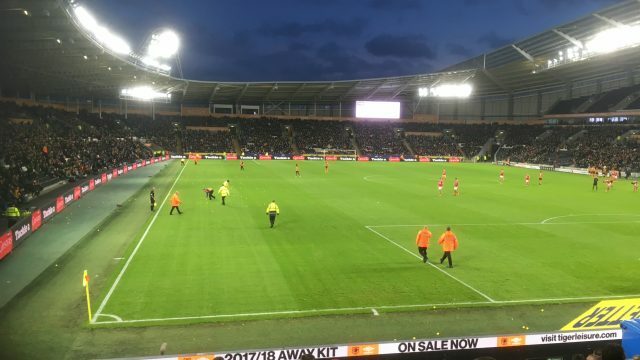 Since the name change was rejected, the owners have sulked and the lack of reinvesting the big TV money Steve Bruce and the players earned has come home to roost. We’ve turned over an entire squad in the last 18 months, we’ve bought replacements on the cheap and not kept the best loan players either. I don’t particularly rate Nigel Adkins but it’s a difficult rebuilding job. That said, we shouldn’t be as bad as we are – there is talent in the squad. 4. Eric Lichaj made the switch to Hull in the summer after a number of years with us. He split opinions at Forest but was well liked and was one of a few who stuck around and came out with any credit for a dark period. How has he fared so far at Hull? He’s been our best outfield player. He was a bargain at the price you let him go for and his experience has been useful in an inexperienced squad. He’s not spectacular but he’s reliable and he’s played three positions already with no fuss whatsoever. 5. One of the issues stated with the Allam ownership is the lack of concession tickets. Is that still an ongoing problem and how much has it had an impact on supporters? It is a major contributory factor to our attendances being absolutely abysmal. We were getting crowds of 18,000 in the Premier League and some of them barely top 10,000 now – despite the lies told in the “official” figures. The closure of the upper West Stand forcing people from their seats, the decimation of the squad, turnover of players and managers and the owners generally being hateful add to that whole powderkeg of faeces. 6. On the subject of ticket pricing the pricing structure in the away end is always a bit confusing. We were offered three separate prices of £18, £24 and £27. With the away section being in the corner of the ground it’s hard to understand how they differ as the view is generally good wherever you are sat. Can you explain at all? We now have a “zoned” ground. So the very corners are cheaper than behind the goals or along the side. It’s the same for home fans. It’s laughable until you realise the cheapest you can take yor kid to the game for is £18 and then it stops being funny. Get the Forest fans to throw yellow balls on to the pitch in protest! 7. We’ve drank previously both in the town centre and around the ground. Where would you point Forest fans in the direction of for a pub before the game? If you’re not in a rush, the Old Town has excellent pubs and eateries. Google “High Street”. It’s a 15-20 minute walk through the centre from there. If you’re in a rush, the Walton Club generally suits away fans and is cheap and cheerful and there’s a good chippy nearby. We’ve improved of late, particularly at home but Forest are starting to look the part so I’m going for a draw. We usually score so 1-1. 9. 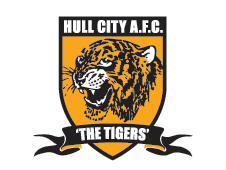 What would represent a good season for Hull? Staying up and getting new owners. To be fair, going down and getting new owners wouldn’t be the end of the world.